KD Fasteners’ 300 series stainless steel heavy hex nuts are an excellent pairing to 300 series stainless steel heavy hex bolts in outdoor settings. 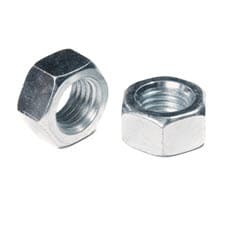 Heavy hex nuts are six-sided nuts with threads in the middle meant to mate with heavy hex bolts with similar threads. Using one of the 300 series stainless steels in our heavy hex nuts make them a far superior metal to standard stainless steel as they are less corrosive when exposed to the environment. 300 series stainless steel is 18 percent chromium and 8 percent nickel which is why it’s also known as 18-8 stainless steel. KD Fasteners, Inc. offers ready and custom made 300 series stainless steel in the following grades. 300 series Stainless Steel hex nuts are available in standard (inch) and metric sizing and are made in the United States. Off-the-shelf sizes range from a ¼ inch to 3-inch diameter. Whether you need a standard or custom size, KD Fasteners has a solution for you. Contact us today by calling 1-800-736-5014 or filling out our contact form.